Agriculture is currently facing a lot of setbacks in all ramifications that is why its effects have not been felt as expected. Agriculture should not be seen as an alien or relegated profession, rather it’s what we should all embrace and practice. Many young graduates and youths in Nigeria don't want to engage in agriculture because of the so many challenges facing it. While some give flimsy reasons like 'farming is a dirty job', others complain of more genuine reasons such as loans, inputs, and mechanization. Currently, the biggest problem agriculture is facing is mechanization. 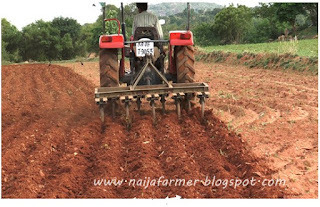 Nigeria really needs to look inward on farm mechanization, it is high time we left cutlass and hoe for more sophisticated implements. We have human resources who are willing to practice agriculture but farm machinery is indeed a challenge. Truly, health is wealth but it’s only a mechanized farmer that this expression favours. It takes less than one hour for a tractor to plough one hectare but it takes over two days for farm labourers to plough up one hectare with hoes, a task that after completion they need to use a large percentage of their income for medication, a task that cannot be done twice in a week. This indeed is setting us back. Truly, there are mechanized farms in Nigeria but why do we still suffer from scarcity of food? Why do we still buy food products at exorbitant prices? The reason is just that the supply from these farms is far lower than the demand owing to the huge population of our country. The reason why will keep on importing foods if not checked. There are small scale and aspiring farmers who are willing to contribute to the development of the agriculture sector but due to their poor input, their output is tremendously negligible. If these set of farmers are identified and put on their feet, there would be a great improvement in agriculture. Let us all clamour for this, this is one of the ways government can rejuvenate this sector. This can be achieved by the provision of improved planting material, fertilizers, herbicides for planting and quality animal feed and medicines for livestock farmers. The job saddled upon the farmers is to provide food for the nation, farmers need improved seeds and quality feed to increase yield. To feed a nation the farming inputs must be of high quality, its high time we got it right. Government interference is needed in this aspect, there should be free or highly subsidized quality farming inputs and quality animal feed for our farmers. Government should make policies that favour Agriculture, unfriendly policies kill Agriculture. Agriculture should always be seen as a factor in national decision making because it is the surest and most unique source of revenue for the nation and citizens. One day our oil will finish so also natural minerals because they're non-renewable but agriculture cannot fade. We have all the primary resources, our large expanse of land, and human resources. Food is one of the basic necessities of existence, everything must be done to sustain it. So our Government should enhance our agriculture with their policies. Some of these policies should include reducing the tax burden on farmers. Tax paid by farmers should be meager because they are serving the nation. So also procurement of loan should be easy and simple. Another aspect is placing high tariffs on timportation of foods that are produced in the country or totally banning their importation, in order to aid farmers. Government policies to makes agricultural loans with a single digit interest rate to be easily accessible to farmers and prospective farmers should be put in place. The requirements and conditions for procuring loan should be friendly and not difficult. The lending policy has to be friendly. There are farmers who are willing to expand their business but due to lack of favorable loan, they couldn’t explore their potentials. tGovernment should take a close look into the lending policy of loans to farmers, it should be a relief and easily accessible. Another cogent point is updating the farmers' knowledge through seminars and extension services. Prospective farmers whom are not graduates of Agricultural sciences should also be trained on the farming venture they want to engage in. These will help them cope with challenges they might encounter in the advent of the farming venture. Truly we have agricultural extension agents but the fact is, they are passive. Their impacts are not felt within the farming community. Government should organize trainings for the farmers at least twice in a year, bringing in facilitators from farming communities abroad. Kenya is a base for cattle rearing especially dairy farming. Nigeria is far from meeting the demand for dairy products, government should look closely to this. Fruit crops, vegetables like pepper, cucumber, tomatoes, onion, grains like maize, beans, and tubers like cassava, yam, etc. And also animal products and by-products should be prioritized and closely monitored. The Agricultural research institutes and agricultural extension arms of universities should be primarily involved to reach out to farmers. Government should provide good storage resources to prolong the shelf-life of these produce. During the rainy season, when the medium and small scale farmers cultivate, there produce becomes surplus which some waste away due to lack of good storage facilities. Government should provide such facility to these farmers for them to preserve their produce throughout the year. The implication of this is that the price of any agriculture produce remains the same through the year.This is how a nation should be, the prices of all commodities should be regular. It's achievable through the intervention of Government. Government should focus on the small scale farmers and not the large ones. Government should empower the small-scale farmers to reach the level of the large ones and not otherwise, this is how the agriculture sector can be developed. Lastly, Government should ensure agriculture development projects are carried out as planned, there should be a measure to evaluate the project also a feedback platform where the beneficiaries of the project affirm the efficiency of the project. Let’s revitalize Agriculture, it pays!